Adolf Schulz-Evler: Arabesques on themes from "The Beautiful Blue Danube"
Leopold Godowsky: Concert Paraphrase on "Die Fledermaus"
Moriz Rosenthal: Fantasy on Johann Strauss on themes from "The Blue Danube", "Die Fledermaus" and "Freut euch des Lebens"
In what is often referred to as the "Golden Age" of pianism – roughly, depending on who is doing the referring, the first four decades of this century – no self-respecting virtuoso was without his (or her, but usually his) selection of outrageously difficult encore pieces. And in an age when the pianist-composer was far more common that today, many of these pieces were transcriptions of the pianist's own devising. The primary target of their zeal for transcription was that most popular of Viennese composers, Johann Strauss II. In fact, as is clear from this CD, the term "transcription" is really something of a misnomer, and the composers themselves make this clear, using varying terms – including "arabesques", "humoresque" and "concert paraphrase" – for their elaborations. So why don't we hear these pieces more often today? The reasons would appear to be twofold: firstly, the art of transcription went out of fashion and those who indulged in it were not considered sufficiently "serious" for true musicians, as witness Ferruccio Busoni's bon mot: "what is the difference", he would ask, "between Godowsky and a pianola? Godowsky can play ten times as fast, but the pianola has ten times as much feeling." The second reason is probably that there is currently a severe shortage of the kind of pianist capable of playing these dazzling, glittering works with the requisite flair and panache; this music requires both technique and charisma – and many pianists today, one suspects, simply don't think the end result worth the effort. 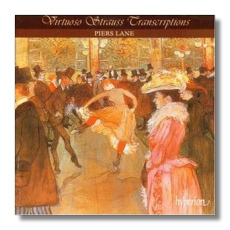 Piers Lane – also the soloist on several of Hyperion's Romantic Piano Concertos CDs – certainly has both the technique and the personality for this music, and the 73 minutes of this disc are, for me, pure delight. Moreover, the personalities of the original composers come through in their very different ways, so that there is no danger of tedium setting in, despite the fact that some Strauss originals – notably The Blue Danube and Die Fledermaus – show up more than once. However seriously you take your music – and I take mine very seriously thank you – if all you can say of this is that it is shallow and superficial, then I believe that says more about you than it does about this music itself. For example, sample the opening track Schulz-Evler's "Arabesques on themes from 'The Beautiful Blue Danube'": Lane's playing sparkles and scintillates and never – even during the most complex and decorated passages – loses its feel for the dance itself. How can anyone fail to enjoy this? Anyone still breathing that is. Although many of these pieces have been available on disc in the past, it has usually been as part of recitals. I have never come across a complete disc of Strauss transcriptions before and I should hate to be parted from this one now. If I have any favourites here, they are the Schulz-Evler – for its sheer panache and joie de vivre – and Godowsky's "Concert Paraphrase on 'Die Fledermaus'" for its knuckle-breaking demands and the never-failing intellectualism of Godowsky's arrangements. Perhaps Lane could now be persuaded to the rest of Godowsky's fearsome output in this medium? There are few enough pianists operating today with the necessary qualifications. Oh yes, the recording is up to Hyperion's usual high standards – has anyone ever heard a bad recording from this company? In fact I can hardly think of enough good things to say about this disc.